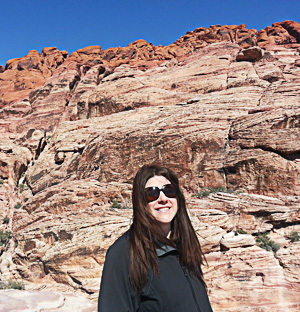 Joanna joined Coaxsher in early 2009 and was a big part of the initial PPE design process. Pretty much anything you can dream up, Joanna can make it. I began my professional design career in 1979 working for a Marine Canvas company in the Seattle area. Making sails, structured boat canvas & interior boat design. Following that, I founded, owned & operated a production company of industrial outdoor gear & clothing, primarily for the Commercial Fishing Industry. Later, I added a small retail store to this company, expanding into ski & backpacking gear & styled clothing. I owned & operated these two businesses for 11 years. Then pursued my other passion professionally and worked as a Chef for a few years before returning to my design & production roots for Coaxsher in 2009, where I have been an Assistant Designer to Kevin Cox and Floor Manager in the Production Department. My hobbies & interests include cooking & entertaining, time with family & friends, art, kayaking, skiing, sailing & being outdoors and hangin with my dog, Earl. Maria joined Coaxsher in April of 2010. Maria's passion is to create and sew and it shows in everything she puts her hands on. I've had sewing jobs since I was 13 years old. Even in my spare time I find myself sitting behind a sewing machine - just can't get enough of it I guess. =) I worked for Jansport in the past. 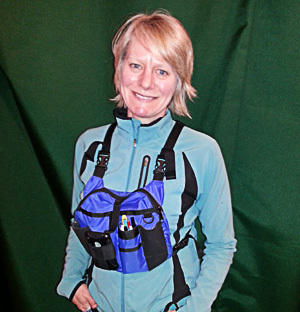 While at Jansport I learned to create and sew backpacks along with many other outdoor gear products. In my off time I enjoy sewing, cooking, and decorating for events and family parties. 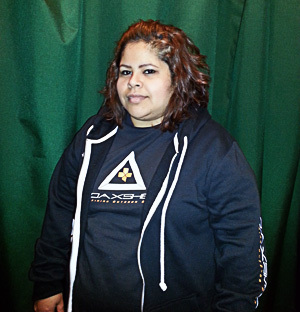 Adriana joined Coaxsher in March of 2011. Adriana is a terrific sewer and always comes to work eager to learn new skills and techniques. Her attitude and work ethic is excellent, and her three-milk cake is crazy good. My work history ranges from many different jobs but my favorite jobs have always been in the sewing industry. I started with industrial sewing at Jansport, sewing backpacks. After some time babysitting, a friend of mine told me that Coaxsher was hiring. I missed sewing and decided to apply for a job at Coaxsher. Guess what? I got the job! At Coaxsher I sew pants, shirts, and many backpack components. I am very happy with my bosses and everyone else I get to work with at Coaxsher. My hobbies are sewing, cooking, and being with my family. (This includes my pets) I love to sew. I also enjoy cooking three milk cakes. Finally, I really enjoy spending time with my family and walking my dogs. Rowena joined Coaxsher in November of 2011. Rowena for sure lightens the mood in production with her sense of humor and funny jokes. There is no joking around when she's at the sewing machine though, Rowena delivers serious skills in all areas in production. I grew up in the rice fields in the Philippines as a little girl. My first paying job was painting figurines and then on to making thread in textiles. My 1st sewing job was at Reebok where I worked myself up to line leader. At the age of 28 I immigrated to the USA and worked at Olympic Sportswear in Seattle WA. I like collecting antique glassware and cruising garage sales. I also truly enjoy learning about other culture's way of life. 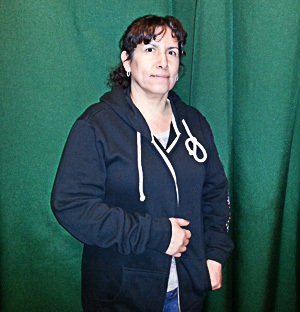 Silvia joined Coaxsher in March of 2012. Hard to find Silvia without a smile on her face - she is always positive and has a great work ethic. 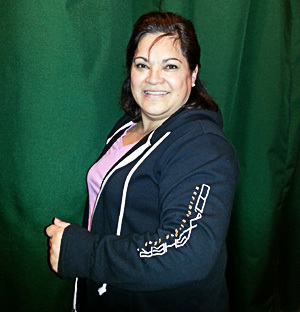 Silvia has great skills on many of our industrial sewing machines and fits right in at Coaxsher. I was born in Michoacan, Mexico and came to the USA 17 years ago. Over the years I have worked many different jobs. My mother taught me the skill of sewing when I was 14 years old. Joining Coaxsher was the first major introduction to industrial sewing machines for me. From my many years experience designing and sewing it was easy to adapt to the industrial machines. I really enjoy my job because it's what I've always liked to do. Some of my favorite hobbies are cooking and photography. I like to enjoy the beauty of nature. Jennifer joined Coaxsher in May of 2012. 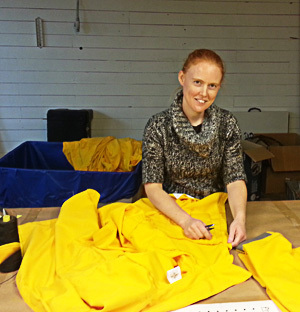 Jennifer has great attention to detail and does great work at the sewing machines. She also makes one heck of an apple pie! In 2003 I started making and selling crafts at local farmers markets. This was a great outlet for my creativity. Among other things, my crafts have included bags, scarves, and driftwood plaques with wood burned Bible verses. (Lake Chelan driftwood of course!) My experience in sewing and my knack for seeing how things are made has helped me to catch on quickly in my work here at Coaxsher. In my free time, I like to sew, design crochet patterns, garden, and spend time with my family and friends. Eva joined Coaxsher in June of 2012. Eva loves talking on the phone, hence the photo. That's a big reason why she's the office manager extraordinaire. Eva does great in all areas of her work at Coaxsher, and is an amazing multitasker. Founded, owned, and operated my own espresso and sandwich shop at the age of 19, operated it for two years until I sold it in 1999. This experience gave me a new appreciation for working for someone else and actually collecting a paycheck. I have held many administrative and customer service positions throughout my life, from a position as a Bank Teller for a large corporate bank to a Starbucks Supervisor. I began my career with Coaxsher in June of 2012 where I currently handle all customer service & administrative duties. On the side I like to find vintage and collectible items to flip and sell on eBay, as well as hawk my hand sewn personal and home accessories. I have experience managing Budgeting, Accounting Reports, Collections, Payroll, WA State Quarterly Taxes, Department of Revenue Excise Tax Reports, Federal Tax Returns, and QuickBooks Premier Professional Services. I have been working with Coaxsher from the beginning and have really enjoyed watching it evolve and grow! Eric joined Coaxsher in Feb. of 2013. Eric knew Kyle and Kevin back in the day from connections in the outdoor gear industry. Eric fits right in at Coaxsher with his love of gear and the outdoors. 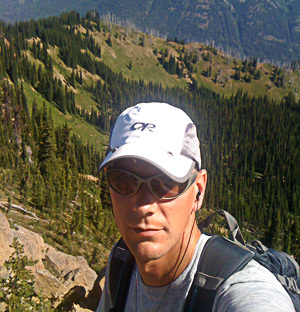 A father to three increasingly tough kids, Eric's hobbies include climbing, hiking, scrambling, downhill and cross-country skiing, bushcraft, snow camping. 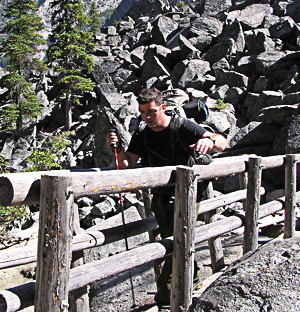 He has worked in the outdoor industry for more than 10 years, and has also managed production in a manufacturing facility. Kyle joined forces with Kevin and Brian a few months after Coaxsher was founded in 2001. Right away Kyle decided to take on the duties of trying to sell the first Coaxsher creations. Kyle spent many long nights teaching himself how to be a web site designer, graphic designer, accountant, salesman, and probably 10 other duties that a new business owner must teach himself. Today, Kyle heads up sales, marketing, and advertising efforts. He also loves working on new product designs. My first jobs were with the USDA Forest Service based out of the Entiat Ranger District. 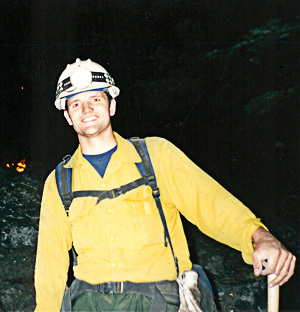 With the USFS I worked in silviculture, road maintenance, and of course FIRE! In fire I worked both on the Entiat IA Crew and also the Entiat IHC. I truly enjoy being outdoors. I graduated from Entiat High School in 1996. I have two AA degrees. The first is an Associate in Arts and Sciences degree from Green River Community College. The second is an Associate of Applied Science degree from Renton Technical College. My favorite hobbies include: golf, backpacking, riding my 450cc dual sport, snowmobiling, and flying my powered parachute aircraft! (Go cart that can fly) I have a fantastic family (Wife Apryll, Son Ashton, Daughter Olivia) that I love spending time with. Kevin co-founded Coaxsher in the early days with a great friend Brian Asher. The idea was simple, let's make outdoor gear with better designs and function. I am a hiker, scuba diver, pseudo engineer slash ultralight pilot slash dirt bike rider with a formal education degree in Automotive Technologies. I head up the Coaxsher design/production departments. I manage and operate R&D. (the wacky idea section at Coaxsher) I also have extensive knowledge operating CAD design software and making products come to life.